Hot off the presses! 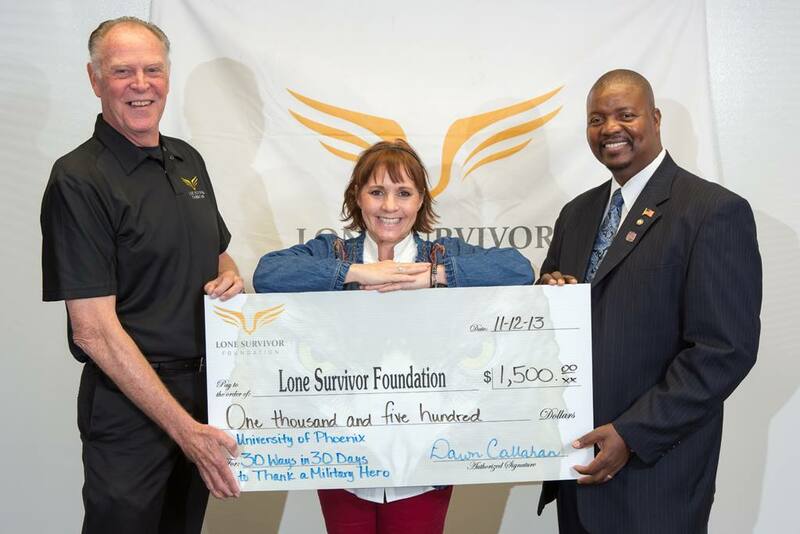 Dawn Callahan of Houston, Texas, is the winner of the University of Phoenix Military Community / Phoenix Patriot magazine’s “30 Ways in 30 Days to Thank a Military Hero” promotion. Dawn’s idea was to support the Lone Survivor Foundation‘s Therapeutic Retreats for veterans and their families who face mental and physical health challenges. Congratulations, Dawn! 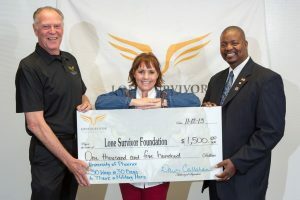 Honoring Dawn’s idea, University of Phoenix is supporting LSF with a $1,500 contribution in her name. Executive Director, Terry Jung, Dawn Callahan and University of Phoenix representative Larry Carlton (left to right). next post: Texas Retreat Facility on the way!